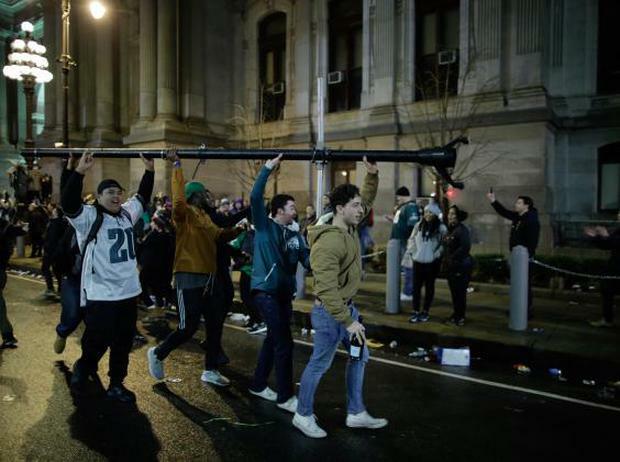 The Philadelphia Eagles' first Super Bowl victory set off rowdy celebrations in Philadelphia as people who poured into the streets set at least one fire and damaged property early on Monday, images on social media showed. Joyous football fans burst into jubilation in gatherings at bars and took their party into the streets, jumping up and down, setting off pyrotechnics and singing the fight song "Fly Eagles Fly." Some went further and ignited a fire in the middle of a street that firefighters soon extinguished. Other images showed a light pole tipping over and the Philadelphia Inquirer and Daily News website Philly.com reported smashed windows and toppled awnings. Police in riot gear and on bicycles formed lines to control crowds and push people back, social media images showed. Some people broke a display window at a department store near City Hall, and looters broke into a convenience store, grabbing merchandise and screaming, "Everything is free," Philly.com reported. Nearly all the light poles on one side of City Hall were toppled, and a car outside a hotel was tipped on its side, Philly.com said. Philadelphia police and fire officials did not immediately respond to Reuters requests for information. The Eagles, coming into the game as underdogs, defeated the five-time National Football League champion New England Patriots 41-33 in Minneapolis on Sunday. In Boston, local media reported somber Patriots fans spilling out of local bars and heading home in the cold winter drizzle as temperatures dipped into the 30s (Fahrenheit). "We haven't had a single incident, thank God," said a Boston police dispatcher. Over in Amherst, Ma., State and University of Massachusetts police had more trouble as about 2,000 people flooded the streets near UMass Amherst and began throwing objects, setting off smoke bombs, fireworks and starting fistfights. The Boston Globe reported a number of injuries and that at least six people were arrested as police used pepper spray to disperse the angry fans.